You'll be £29.99 closer to your next £10.00 credit when you purchase Boeing 707 Group. What's this? Order within the next 4 hours, 36 minutes to get your order processed the next working day! The Boeing 707 family - that includes the forerunner Model 367-80, the KC-135 series of military transports and the slightly smaller Model 720 - was the pioneer of the sweptback wing, incorporating podded engines borrowed from the B-47 military bomber. It was the aircraft that many regard as the design that really ushered in the Jet-Age. This new book from the established aviation historian Graham Simons examines the entire course of the Boeing 707’s history, charting an impressive design evolution and illustrating the many ways in which the 707’s legacy continues to be felt to this day. 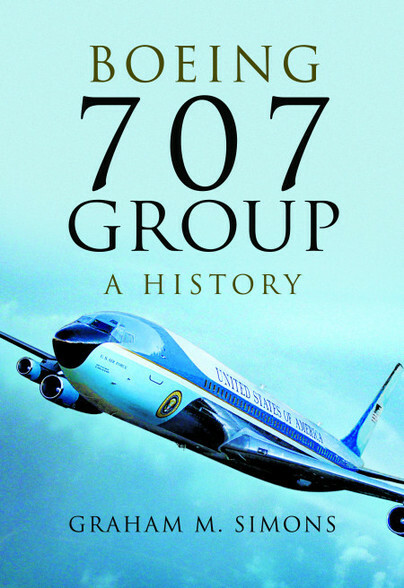 In laying the foundation for Boeing's preeminence on the word’s jetliner market during the 1980s and 90s, the 707 paved the way for future innovations in both civilian and military fields and Graham Simons has put together an image-packed history that records the historic and landmark milestones of this iconic aircraft type. While recommended for the general reader, this should be an essential addition for 707 enthusiasts. Splendid the iconography part, with beautiful photos and many posters and poster of the time, with which it is fulfilled a nostalgic return to the sixties. ...this is an impressive volume that is well-written, and easy to read. Its research is of a high standard. It will, of course, appeal to Boeing 707/ C-135 ‘enthusiasts’ and as such could well become a ‘Standard Reference Work’ on its subject.